Discover the ethnic minorities and the natural beauty. Walk in the beautiful valley of rice terraces. The amazing Dong Van Karst Plateau Geopark. Enjoy the great view of the grandiose Mapileng pass. View the stunning Ban Gioc waterfall and Nguom Ngao cave. Experience a homestay in the local villages. 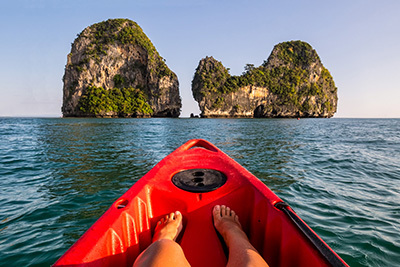 An unforgettable overnight cruise in the middle of Bai Tu Long Bay. Trek in the middle of Cat Ba national park to Viet Hai Village. A boat trip around beautiful Lan Ha bay. Home to Tay people at Tay Con Linh mountain range. Depart from your hotel in Hanoi to Ha Giang via the highway to Phu Tho. Stop to visit the Zao village at Ham Yen, Tuyen Quang. First, discover the houses on stilts, a typical style of ethnic groups in this undulating region. Enjoy a delicious local dinner. Overnight in Tha Village - home stay (basic comfort, house on stilts). Walking distance: 5km – 1.5 hours. In the morning, depart to Ba Be. On the way, you will enjoy the magnificent landscape of the villages nestled in the flank of mountain. Stop on the way to meet the natives and take photos wherever possible. Cycling through several villages of ethnic Tay people to Hua Ma cave ( 5km from the village). This is an attractive place with amazing formations of stalactites and stalagmites. Dinner and overnight in the homestay. Driving time: 4 hours – 140km. Free in the morning to relax in the peaceful village by the lake. Then transfer to Hanoi. 11.45 Arrive the pier and take a transfer to Gia Luan port for a discovery trip to Cat Ba. Overnight at Hotel in Cat Ba island. In the morning, transfer from your hotel to the gate of Cat Ba national park to begin your day of trekking through the park to Viet Hai Village, a great experience in the heart of the natural world biosphere reserve. Trek 9km through the primitive forest, and spend a full day discovering the tropical biodiversity of the flora and fauna. The trek will take you to Ao Ech (frogs pond) located 80m high, in the center of the park and covering an area of 3.2 hectares. This is the largest fresh water lake on the island and feeds all the surrounding wildlife. Continue to conquer the path in the forest as you strenuously scramble over the rocks on the way. At last, you will reach Viet Hai Village, inhabited by fifty Viet families. The natives live a simple life and will pleasantly surprise you with their exceptional hospitality. Enjoy a late lunch in the village then continue walking or biking on the beautiful road to Viet Hai pier where our boat awaits for a cruise in to Lan Ha Bay. Whilst sneaking through the charming limestone islands, discover the fishing village and swim if time permits. Arrive in Ben Beo pier and transfer to your hotel. Free in the morning, transfer back to Cai Vieng port. Embarkation a ferry to Got port, our driver will pick you up back to Hanoi. Free till transfer to airport for flight home.